The timber frame barn was built in 1905. It is 3,300 square feet and can comfortably seats 200 guests, with plenty of room for dinner and dancing. In 2012-2013, it was renovated to restore its original structure. Wagon wheel chandeliers and a unique bar constructed from French wine barrels and the original barn doors were added. The surrounding farmland offers stunning views and sunsets. 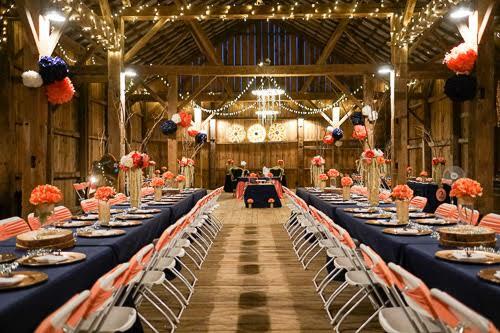 Included in the rental fee are the use of tables, chairs, white china, flatware, ivory or white linen tablecloths and white napkins, burlap runners, mason jars or water glasses, bridal dressing room, and much more. There are no catering restrictions and alcohol is permitted, with use of certified bartenders and licensed security personnel.